We begin our Race Series with a registration evening at the Taupo Velodrome on 2nd October at 6pm. Racing at Bruce McLaren Motorsport park will Commence 9th October for a 20 Week race series. Registration begins from 5.30 at the track with racing starting at 6pm. Weather permitting and any cancellations will be notified on the club FB page around 5pmish. We will be asking for volunteers each week previous as we do need assistance from club members to run the events smoothly. non Taupo Club members may ride for $10 per week (50% discount for juniors). 2019 Taupo Club Memberships can be purchased from Cycling NZ for the 2109 season from 1st October, this will be effective as soon as we have confirmation, and will expire the 31st December 2019. Dates: Registration and first race start, 9th October 2018.Proposed 20 week series with last race being 26th March 2019. This series is FREE for Taupo Cycle Club members, non Taupo Club members may ride the series for $10 per week (50% discount for juniors). 2019 Taupo Club Memberships can be purchased from Cycling NZ for the 2109 season ans is available from 1st October 2018, this will be effective as soon as we have confirmation, and will expire the 31st December 2019. Current 2018 membership expires 31st December 2018. Remembering full club membership cost will be $110 for adults and $50 for juniors which will enable members to ride the Race series..
We cannot guarantee that future series will be free. The club will continue to work on .providing cost effective racing for its members. Payment for non members can to be made direct into the Taupo Cycle Club Bank account. Volunteers – We do still require Volunteers to assist on the sideline. We will be asking for Volunteers each week previous and will be done before racing begins. Email secretary@taupocyclingclub.org.nz . Race Numbers - Our Race numbers have been kindly sponsoured by the Fern Cafe. Please wear these with pride and support local business that supports local riding. New numbers will be allocated for the series so plesae no old numbers. Numbers are to be pinned on left hand side and across the back and be clearly visable. Riders keep your numbers but you do need them for each and every race. No number no riding on the track. Volunteers - To be able to run the series we do require assistance from club members. We will be asking for Volunteers each week previous and will be done before racing begins. Parking - Cars are able to park in front of the main grandstand. Please do not park in front of the service buildings in the entrance area. - Payment is to made into club account prior to turning up to race or cash on the night. Points - 1st= 10 . 2nd= 8 , 3rd= 6 , 4th= 4, 5th=3, 1 point for riding. – 27th September, Skills session to be held for all riders whom intend to ride at the series. This will be held at the Taupo Velodrome at 6.00pm. There is no cost for this session for club members and is an opportunity to try out and practice skills aimed towards road racing. This evening will also be the opportunity to register and pay and gain information for the series if unable to do so on line. -4th October, the first evening of racing starts at 6.00pm. Gates open from 5.30, Each rider must sign in and have their numbers visible to be able to start. - Payment is to be made direct into the Taupo Cycle Club Bank account. Registration - With the first night of racing on the 4th pre registration is required if you are wishing to ride then. Race Numbers – Our Race numbers have been kindly sponsored by The Fern Café. Please wear these with pride and support local business that support local riding. Numbers are to be pinned on the left hand side and across the back. Riders keep your numbers but you do need them on each and every race, No number no riding on the track. These are the riders responsibility. Parking – Cars are able to park in front of the main grandstand, Please do not park in front of the service buildings in the entrance area. If you are a 1st time participant, you are very welcome to ride. The cost is $5 for 1 race, following this a membership and payment for the series is required. Taupo Cycle Club are pleased to announce the dates of the Summer Series 2016, Located at the Bruce McLaren Motorsport Park.This year there will be a new format for registration and can be done online via the Club Website. We will require riders to be a Taupo Cycle Club member and payment for the series to be paid by all who ride prior to series. Payment for the series can be made direct to the Taupo Cycle Clubs ANZ Taupo Bank Account No: 06-0429-0084104-00. Follow this link to register and receive your race number. February 2nd will be a registration/ skills night to assist those that have not already registered to do so. Upon registration you will receive your race number which you hold for the duration of the series. If entering part way through the series the cost will be prorated at the cost of $5 per race. Participation will cost club members $40 (Adult) $20 (Junior U19) for the series. However to achieve this series we require volunteers, so we will be running a roster system for time keeping and race director etc. We require 3-5 volunteers to assist per night to assist. There will be a roster available on the first night so feel free to commit to at least 1 night each and put your name in the slot that suits you best. Let’s share the workload and get everybody enjoying all aspects of Club racing. Track entry will be as per normal, Gates open at 5.30 racing starting at 6.00. Cars are allowed to park in front of the main grandstand. Please do not park in front of the service buildings in the entrance area. Racing will conclude on 29th March the week before daylight savings ends. 1st=14 2nd= 12 3rd=10 4th=8 5th=6 2points per finisher. 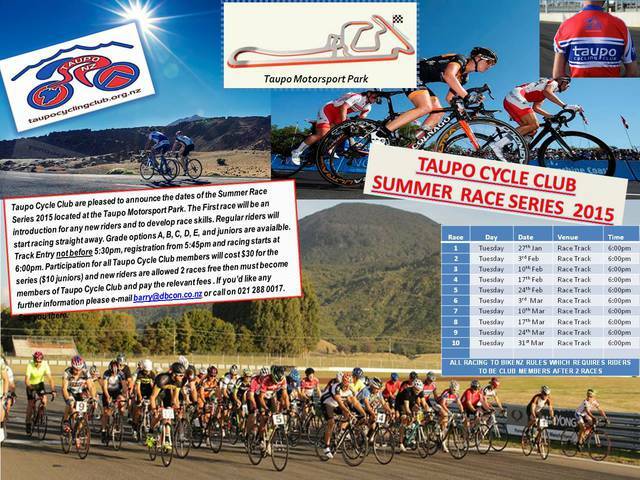 Taupo Cycle Club are pleased to announce the dates of the Summer Race Series 2015 located at the Taupo Motorsport Park. January 27th will be an introduction for any new riders and to develop race skills with racing starting for the regular riders. Grades A, B, C, D, E and Juniors. Track Entry not before 5:30pm, registration from 5:45pm and racing starts at 6:00pm. Participation for all Taupo Cycle Club members is $30 for the full 10 week race series and $10 for junior riders. New riders are allowed 2 races free then must become members of Taupo Cycle Club. If you’d like any further information please e-mail barry@dbcon.co.nz or call on 021 288 0017. See you there. Non-members are welcome to ride twice at the track, after that they will need to have a Bike NZ membership. This protects the club and has insurance implications if we allow non-members to ride. …However to achieve this we will need your help, we need 5 volunteers/time keepers each and every night . That’s 1 from each grade, please help out for the benefit of all. We also arranged to allow cars to park in front of the main grandstand, so please bring your vehicles in and do NOT park in front of the service buildings in the entrance area.